Ever wondered why I'm so fussy about 'clean' lighting with my coloured gelled photography? Well it's because failing to produce cleanly lit shots with gels, simultaneously produces horrendous looking shots with gels. When I refer to clean lighting I'm referring to the fact that I like to keep all of my lights in my scene exactly where they're supposed to be. If I have a background light then I have it lighting the background and nothing else, when I have a hair light, I have it lighting the hair and nothing else and so on. This might seem fairly obvious but when you're using white-light and large modifiers like softboxes, the lighting is going everywhere whether you like it or not. We simply can't get away with being that sloppy with coloured gels. I will explain colour banding more thoroughly later on in this article but for now just know that it's where adjacent colours don't appear to blend very smoothly. They 'step' quite aggressively like you see here on this models arm. The colour appears to go from blue to grey to orange and this can be sometimes be referred to as colour banding. But is that accurate? So why do I insist on clean lighting with gels? Well it's because when two coloured lights mix, they don't mix like paint, they mix like light does. Not only don't they mix like we think they should but they start to produce an awful looking side-effect we call 'colour banding'. I'll go into what colour banding is and what that looks like in more detail later on but first off let's take a look at what I'm referring to when I say 'mixing' light versus mixing paint. The physical mixing of colours is refereed to via a 'subtractive' colour wheel and this is used in reference to mixing colours like paint. Light hits the paint on a canvas and is reflected back into our eyes and we see the colour that way. This is the regular colour wheel we're all used to seeing and using. 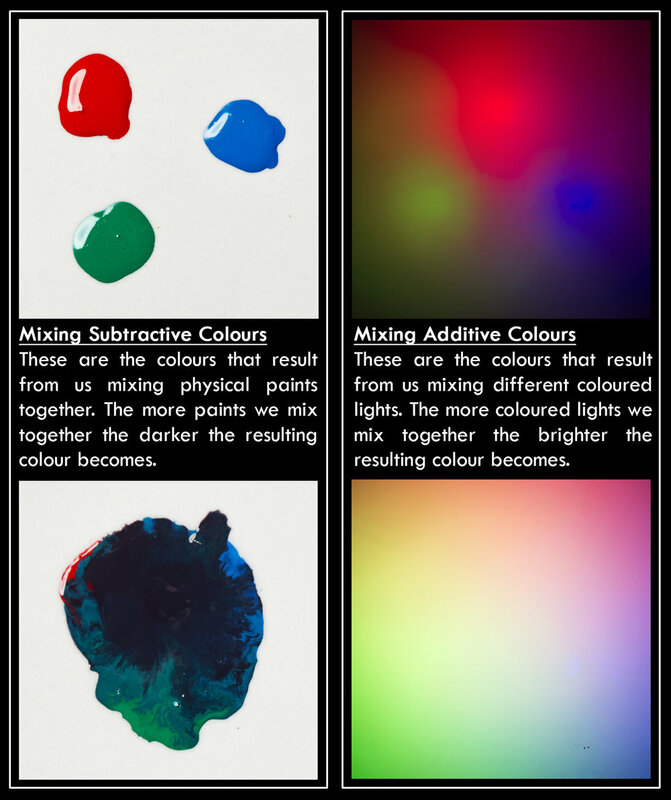 For mixing light however, we use the term 'additive' colours and this is specifically referring to how light mixes from transmissive devices like T.V.s, smartphones and so on. No light is reflected off any surface like a canvas and the colour is mixed as we see it directly on the screen. Click to enlarge - It should be pretty clear to see just how differently red, green and blue mix when we do it with paint compared to light. So before we get ahead of ourselves, what is coloured light? The short-form of this is that white light is actually made up of a full spectrum of colours. Basically that means that when you shine multiple coloured lights on top of one another, you're actually just getting closer and closer to a white light with no colour at all. But don't worry you're not alone if think this is weird because we've all spent our entire early school years learning that mixing colours and paint is very different to this. We've been told that mixing colours like blue and yellow will result in green and that if we mix red and yellow we'll get orange and so on. You can literally forget all of that entirely when it comes to photography and mixing coloured lighting. So how does this relate to us as photographers? Well take a look at the diagram above to get an idea of what coloured gels actually do to our light once it has left the flash. White light leaves the flash and travels into the gel. 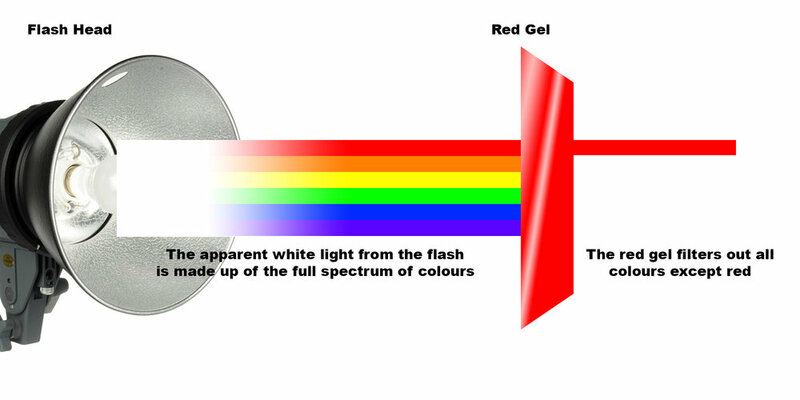 Like we mentioned before, white light is actually a complete rainbow (spectrum) of colour so when it hits our red gel, the gel isn't actually turning the light red but instead it's filtering out all the other colours of the spectrum leaving only red behind. 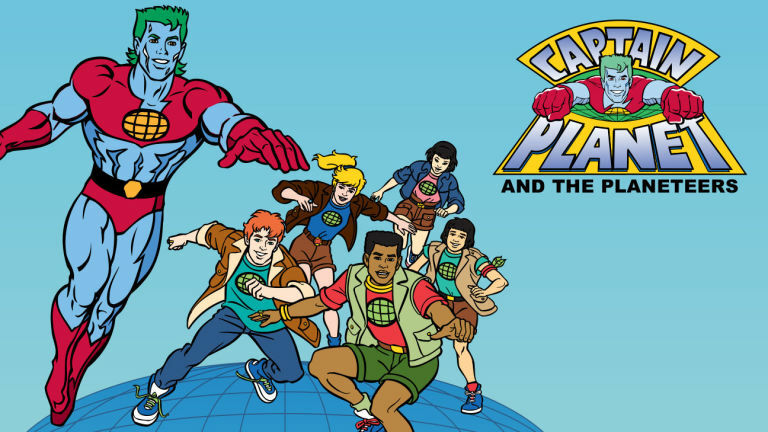 So now imagine the same thing happening with a blue gel and a green gel alongside this too, with their powers combined (they produce Captain Planet - if you get that reference you're officially old ;) ) they create white light once again on the resulting surface. Yes, that's right, you heard me correctly earlier on, there are in fact two colour wheels and we need to understand how they both work, how they relate to one another and what's important for us as photographers before we can continue. 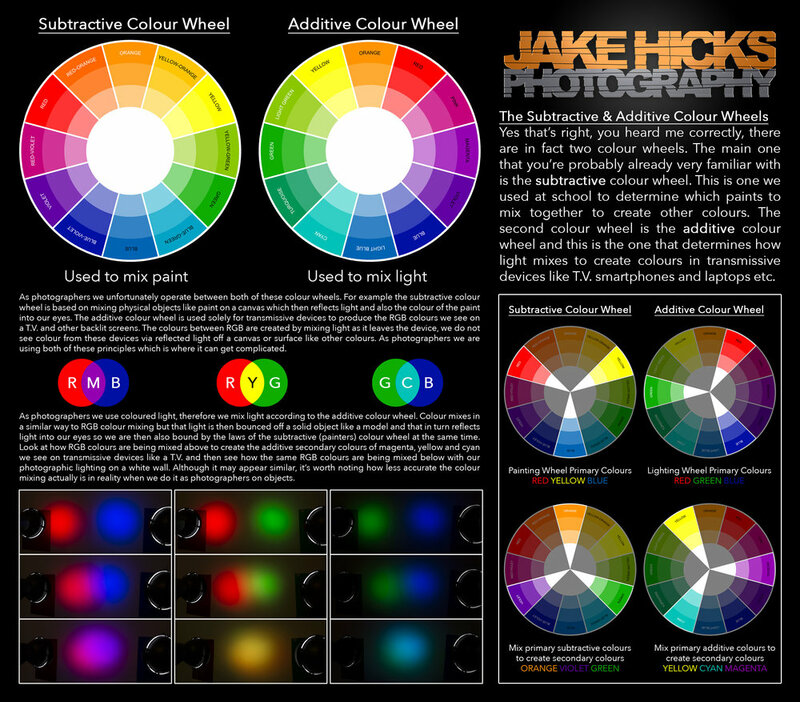 I spoke about 'additive' colours and 'subtractive' colours before, now I'd like to try and explain these in terms that relate to us as photographers so from now on I'll be referencing 'subtractive' colours as the painters colour wheel and 'additive' as the lighting colour wheel as we continue. 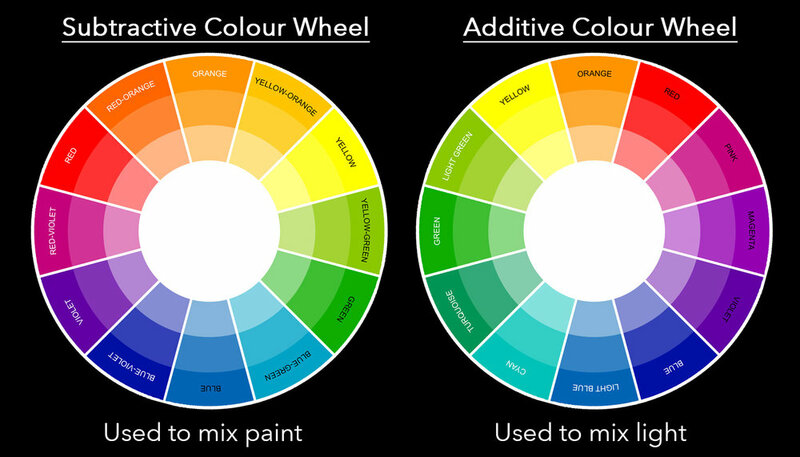 First off let's take a look at how the two colour wheels differ visually. They're certainly very similar but there are a few key differences in the way the colours are laid out to illustrate how colour is mixed between them. 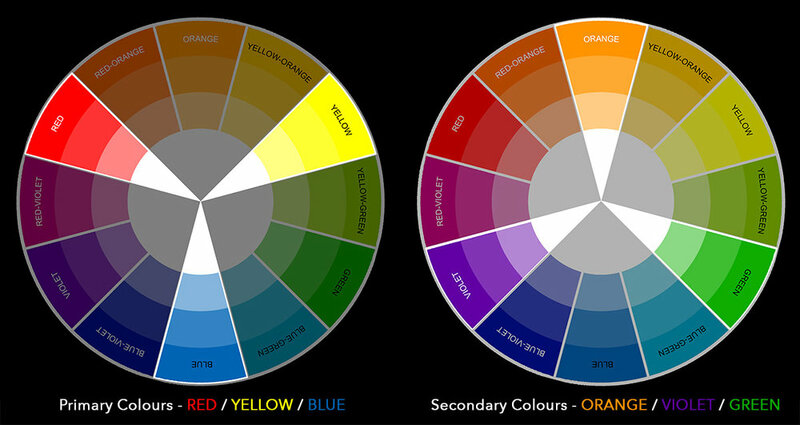 First we should clarify what the primary colours are in both of these colour wheels. If you're not sure what defines a 'primary' colour then it's the core set of three colours that all other colours are derived from. In the painters wheel it's Red, Yellow & Blue and in the lighting colour wheel its Red, Green & Blue (RGB). Click to enlarge - Now we're starting to see a clearer idea of why the two wheels are laid out differently. Between the primary colours are the secondary colours like we see here. So now let's take the principles we've learned about what 'white' light actually is and apply a little colour theory to it. In art we have something called colour theory, this is the principle that certain colour combinations are more favourable and resonate well with us as people over other colour combinations. One of the most popular colour theories is the one we refer to as 'complimentary colours' and this is one we'll be exploring a little deeper with coloured light here. Take a look at the colour wheels above and you'll see the examples of complimentary colours that I've pointed out. These three colour combinations are certainly the most popular; red & green, purple & yellow and orange & blue but is there a reason for that? Well the reason these complimentary colour combos are so popular is because they each contain a primary colour and a secondary colour. If you're a bit rusty on your primaries and secondaries then take a look at my handy image below to refresh your memory. Now let's take a look at how those secondary colours are created by mixing two primary colours. The primary colours and the secondary colours - Mixing primaries will result in secondary colours. For example; yellow and purple are complimentary colours, the other two primaries that aren't yellow are red and blue, mix those together and you get purple which is your complimentary colour to yellow. 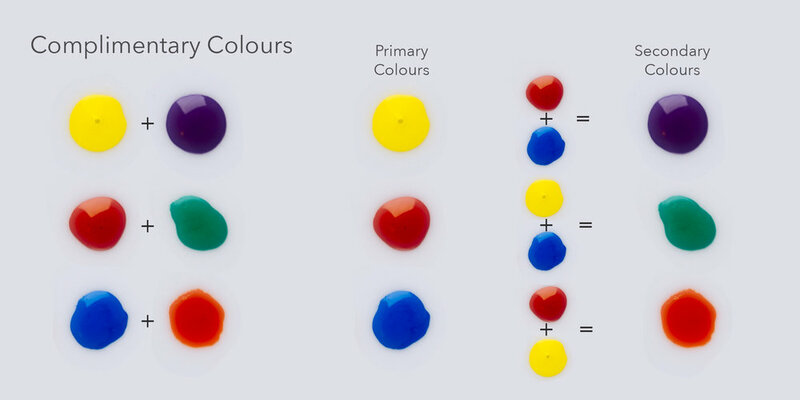 Yes, I do apologise this is a bit of a headache but you really don't need to know the math behind colour theory to be good with it but it certainly can be nice to know how it all ties together. 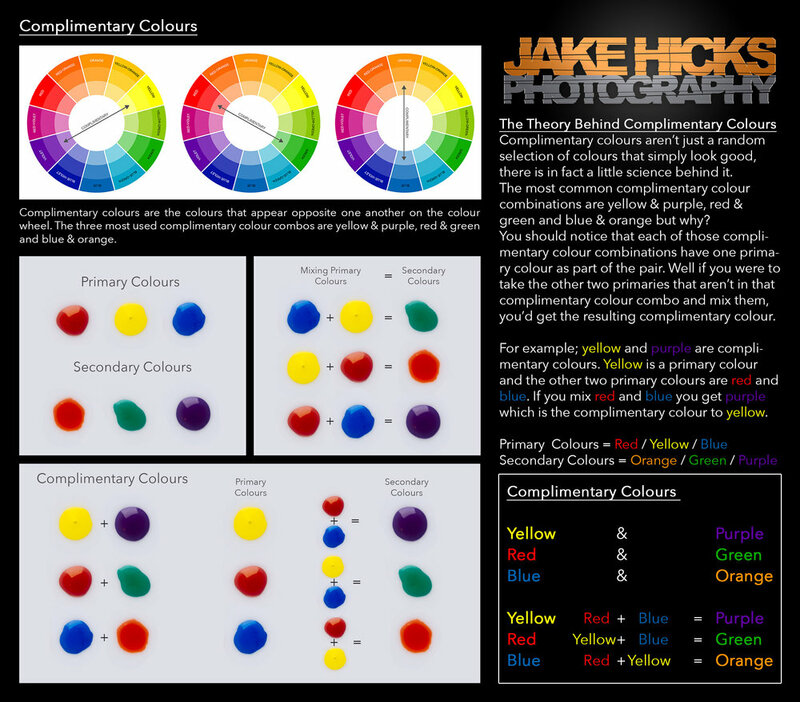 Here's a quick list of the complimentary colours and how they relate to their primaries. 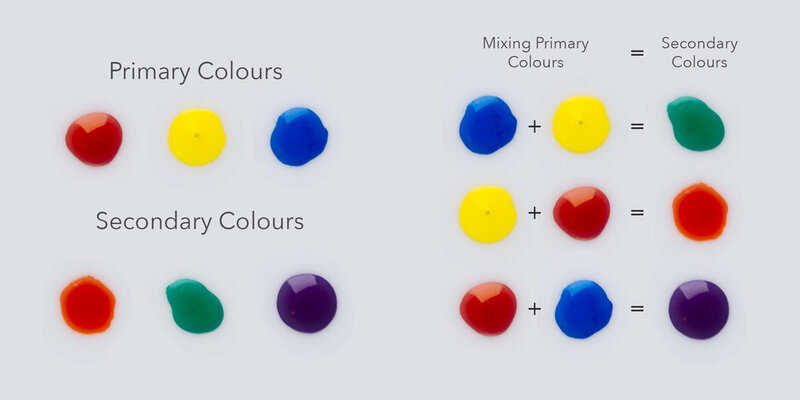 So although you don't need to fully understand the reasoning behind how certain complimentary colours are made, you do need to know how important they are. Everything from room decor to corporate branding to the clothes we choose to wear to the packaging we're drawn too on the shelves undergo colour theory before they're released. I doubt the resulting images below are of any surprise to anybody. Paint mixes the same way physical colours always have done and the resulting colours are the same now as it was when we were crushing up beetle shells and mixing it with fern roots. The important thing here is how different this is to mixing complintary colours in lighting. Yes, when I use the term brown to describe the resulting colours above I'm generalising greatly as there are many different versions of brown but let me explain how the colour theory of paint works when it comes to mixing colours. So when you mix two complementary colors like purple and yellow you simply get a shade of 'brown'. The brown isn't important but what is important is how we get a very different result when we mix complimentary colours in lighting. Okay so now let's take the test to our photography world and see how colours mix when using light compared to paint. First off, let's take a look and see what happens when we mix the lighting primary colours of Red, Green and Blue. This will give us a baseline of how light mixes compared to paint and it will also show us why the RGB colour wheel is laid out the way it is to create its secondary colours of Magenta, Yellow and Cyan. What's interesting about these results is why it is so, so important for us to employ clean lighting when using coloured gels. Thankfully, red and green are two of our primary colours on the lighting colour wheel so mixing those two coloured lights produced the expected results, of yellow but it's when we mixed the other two complimentary colour combinations that it got interesting. It's probably better to say that they actually cancel each other out but essentially mixing these two complimentary coloured lights together removes their colour leaving a dull white colour in its place. So finally, you made it this far and we can at last get into this 'colour-banding' problem that I'm sure we've all faced at some point. So what is colour banding? Well colour banding is that odd 'stepping' of colour that can be produced in very saturated images. Colour banding is when colour doesn't smoothly transition from one colour to another in our digital images. In the image below you should see that the colour on the models arm goes from orange to a grey colour then to blue and this look is often refereed to (sometimes mistakenly) as colour banding. Now technically speaking this example isn't strictly colour banding but for the same of argument we're going discuss what causes this effect and how to avoid it. This infuriatingly ugly effect is a huge problem with coloured gelled lighting and for years I thought it was simply crappy digital cameras not having the power to render all the colours I wanted, and although this certainly plays a part, it would seem it's not all the cameras fault. The above raw image clearly illustrates what looks like colour banding but in actuality it's not the cameras fault but in fact it's messy lighting. What is happening here is two complimentary colours are meeting on the skin and when they do, they go grey as they cancel each other out. Look closely at the circled section above and you'll see that the colour on the arm goes from blue to grey to orange; not a pretty look. Remember what happened in our lighting test earlier on when we mixed complimentary coloured lighting? Look familiar? So how can we avoid this? Well the simple answer is to firstly be very aware of what happens when you mix certain coloured lights together in a scene. The biggest offenders (and likely the ones you'll be mixing the most) are the complimentary colours. Thankfully red and green only produce yellow which although unlikely to be a good thing is still better than grey and of course the biggest culprits being the mixing of orange & blue plus the purple & yellow creating grey. This gelled lighting phenomenon is definitely something that you want to avoid at all costs in my opinion and you can do that with proper light control like we see below. All of the images above show the heavy use of the complimentary colours orange and blue but you should see that I've avoided the dreaded grey colour overlap that can occur by combining these lights by keeping the lighting clean and never spilling the two colours onto one another. Firstly, thank you if you've made it this far in the article, I'm not known for my short, snappy social media posts or articles and this monster of a piece is no different. But I do feel that everything being said here is relevant and although I debated splitting this up and getting multiple posts out of it, I really think everything here needs to be seen together to fully understand what is going on. Although I didn't want to complicate this any further, I will just add that we as photographers actually operate between the two colour wheels. 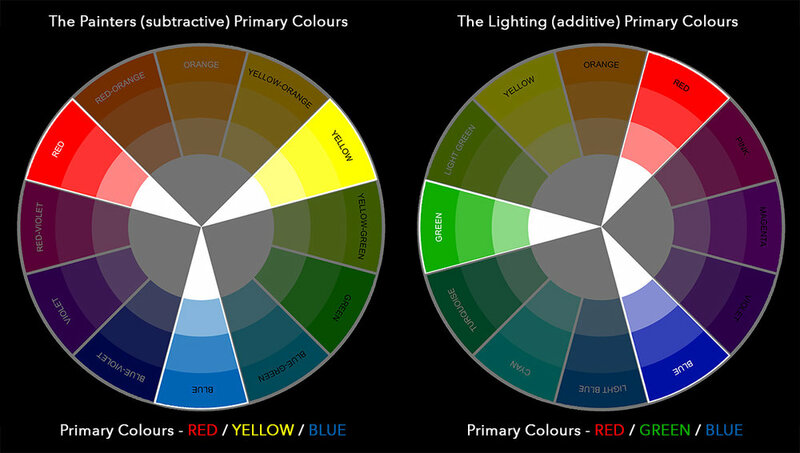 Don't panic, what you've read so far is relevant but we as artists who use light as our medium fall between the two colour wheels because the lighting colour wheel is for transmissive RGB displays only. Yes we use light but we shine that light onto an object and then photograph that reflected light and reflected light is what painters use to mix colour. I know that is a bit of a mind-bender but really all you need to know is that light mixes like it does with RGB but bear in mind that requires a white surface to be the subject for it remain relatively accurate. Chances are you're not photographing coloured gels on white walls so caution is required when making assumptions about the mixing of colour on another surface that has its own colour like skin. Like I said, I didn't want to over complicate something that was already fairly complicated but I wanted to highlight that point to any of you who may have been wondering about it. Always try to keep you coloured lights separate on whatever it is that you're photographing. Failure to do so will result in an ugly looking colour banding effect. 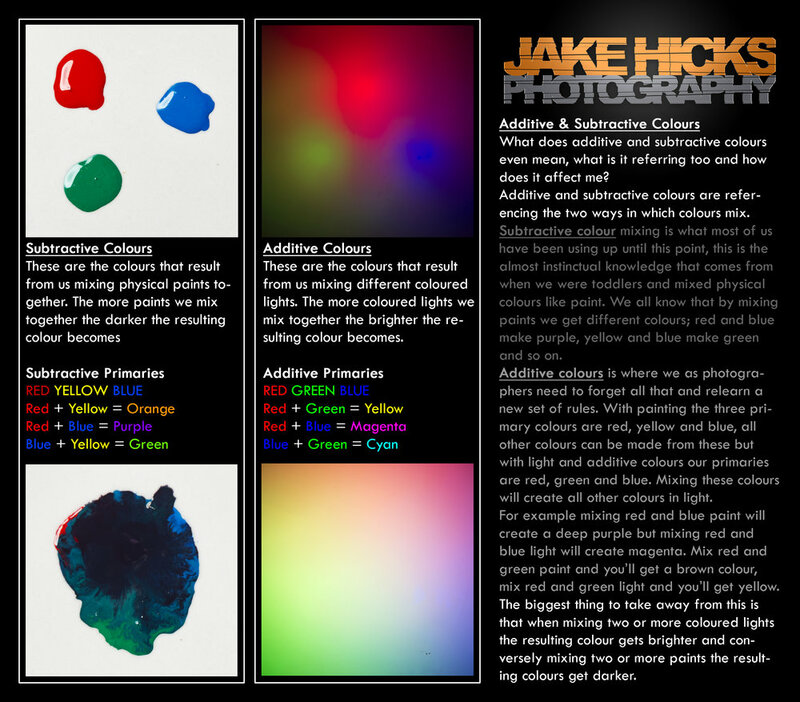 For reference, print out or save these 'cheat-sheets' below on how colour theory works. I know this was a monster-brain-melting-article but I've seen very little on this topic that is specifically targeted at us photographers so I hope it helps at least one person understand more clearly what's going when mixing coloured gels. :WARNING: Items that wants your monies below!